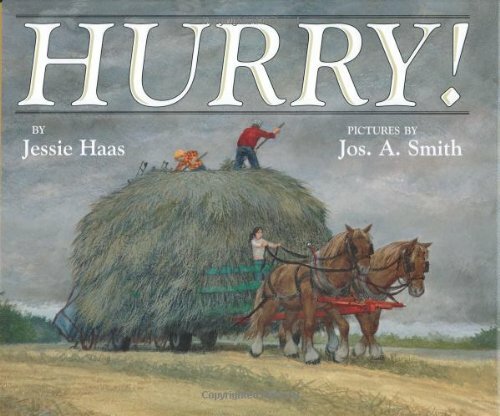 “Hurry!” tells the story of a farmer’s life in one remarkable afternoon — when a summer’s harvest of hay is threatened by rain clouds. “We can’t make the sun dry faster,” says a little girl’s grandfather, who waits on the sun — and worries. He re-checks it nervously, watching the graying sky. “The sun feels weak, but the wind feels strong,” hints the author — and the grandfather has sent Nora to check whether their hay is dry yet. There’s grand illustrations for the story supplied by Jos A. Smith. Using water colors and pencils, he creates a simple beauty for the family that tends the land. On the first page he’s drawn white clouds on a blue sky over a hay field with changing shades of green — and in the center the little girl with the plow horses. Later there’s a hayloader scooping up hay, and Haas describes all the details of packing the hay into the wagon. (Grandpa and his wife move the hay to the corners of the wagon, and trample it flat so there’s more room for the rest.) But the next picture completes the story, showing the hay wagon filled with hay — Nora riding high above the ground — as a shades of grey fill the background sky. The hay wagon is a shadowy grey itself, with small shadowy people riding its load and two shadowy horses pulling. And the family sits on their enormous haystack, and watches the rain outside.